Do I Love my Zeiss 32mm Prime? 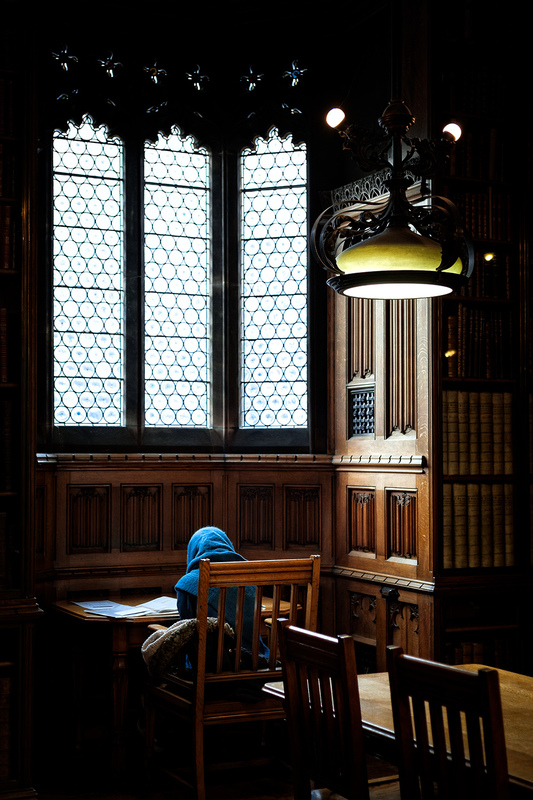 Studying at John Rylands Library, Manchester. Fuji X-T2, Zeiss 32mm lens, ISO800, f/2.2, 1/100″ handheld. The lens is sharp, actually it’s very sharp. It also resolves lots of fine detail, even wide open. But because of this you tend to pick out even the slightest wobble when shooting. I struggled a little in low light situations and found it much better outside. For the image you see with this post, I had to shoot several frames to ensure I had a sharp one. It may be me, not being used to shooting without OIS and using a standard lens. What I do know is that I had a lot more confidence and success when using the Fuji 18-55 kit lens. Most of those images came out sharp whilst taking less care. I love the colours and tones produced by this lens. The contrast and saturation levels are pretty much spot on. I haven’t done very much editing with this image at all. I just set the camera profile and sharpening. I found the autofocus OK but perhaps a little on the slow side compared to my expectations. There was a slight audible noise from the aperture when shooting. Perhaps I only noticed this because I had the camera set to shoot with the Electronic Shutter and the sound turned. That makes the camera silent in operation, so it follows you would hear any noise, especially in a library. In summary, this is a good lens which I’m keeping. It just didn’t blow me away, unlike the Fuji 56mm my friend was shooting with. That may be my next prime lens purchase.